DAAD-Alumni & Friends held its annual meeting of members from 8. – 10. 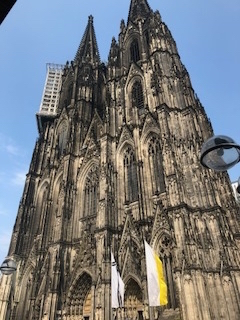 June in Cologne. It is a tradition to interconnect the annual meeting with one of the big DAAD-scholarship holders‘ meetings. So this year, we „piggybacked“ on the DAAD-meeting in Cologne, where the DAAD had gathered over 480 international students to the TH Köln – University of Applied Sciences in order to talk about „Sustainable solutions through applied research“. 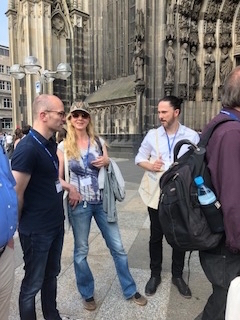 While DAAD-Alumni & Friends had with its 30 participants considerably less (wo)manpower, the enthusiams among the participants was just as high to start the convention weekend. The meeting of members kicked off on Friday afternoon in the college lobby. There was a big Hello among the new and old members. It was a very welcome opportunity for our newly staffed head office to get to know the club members and to see the faces behind all those emails and phone calls. The get-together continued at dinner, which was served in the premises of Cologne’s Hotel Maritim and where DAAD-Alumni & Friends dined together with DAAD-scholarship holders and -staff. 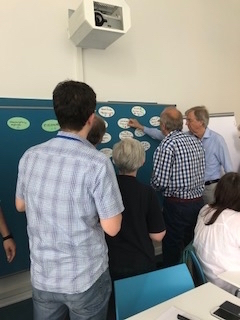 On Saturday, the real work began: Informative meetings for new members, lectures on the work with alumni, and working groups about campaiging and new forms of events invited all members to active participation and contribution. This exchange was especially important for our new head office staff, who gained a deeper understanding of the needs and challenges of the work within regional groups. Even after the sightseeing programme (this year: a guided tour through Cologne Cathedral) the discussions and exchange continued during dinnertime at a traditional „Kölsch Brauhaus Päffgen“, one of the city’s most traditional breweries. A few members took off after dinner in order to attend the scholarship holders‘ final party and to enjoy some more Kölsch beer. Despite party and beer, everyone was on time on 9 am Sunday morning, when it was time for the official part of the meeting of members. Budget affairs, state and perspectives as well as reports from the regional groups and Saturday‘s working groups were on the agenda. Also, the new executive committee was elected for the period of office 2018 – 2020. Dr. Christian Bode (former secretary-general of DAAD) was re-elected as chairman of the committee. His deputies are Dr. Sabine Englich and Henning Belle. Treasurer became once again Dr. Johann Peter Schäfer. You can see the whole new executive committee here. For us in the head office, the meeting was a truely enjoyable event. We take from it lots of stimulation and ideas, that we will pursue in the time coming. We would like to thank everyone for their active participation. We look very much forward to seeing you all again next year!